Teacher burnout and TA exhaustion is a major concern, just like finishing a major endurance race. Really, teaching is like triathlon and finishing the year healthy and strong is just like finishing an Ironman. This session will provide tangible tips and techniques to last the endurance race called teaching. Participants will enjoy a unique angle of looking at teaching and walk away with ideas to make teaching more engaging, inspiring, meaningful and enjoyable for all. Emily Williams Burch is currently working on a Doctorate of Musical Arts in Choral Conducting at the University of South Carolina. Burch is also Founder/Artistic Director of RISE Chorales, a community youth choir in Savannah, GA. She serves in various leadership positions in regional and professional organizations. Prior to beginning doctoral studies, Burch taught at Savannah State University, directed the Savannah Children's Choir, and taught elementary and middle school in the Savannah public school system. 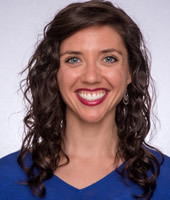 She is the lead choral contributor and teacher trainer for QuaverMusic.com, a job which sends her across the country leading professional development workshops, conference session and teacher trainings. She received her Bachelors and Masters in Music Education at Louisiana State University and Florida State University.